Password protection is crucial in today’s digital age, and the strength of a password is becoming increasingly more complex. We all know that “password” and “123456” are not strong passwords (and yet they remain the two most commonly used passwords!). But passwords like "redhouse146" and "rover1987" are safe and difficult to hack, right? Hackers and hacker software have become so efficient that passwords we think are strong are actually shockingly easy to crack. So what should you do (and not do) in order to come up with passwords that are easy for human beings to remember, yet hard for computers to guess? Don’t have a website yet? 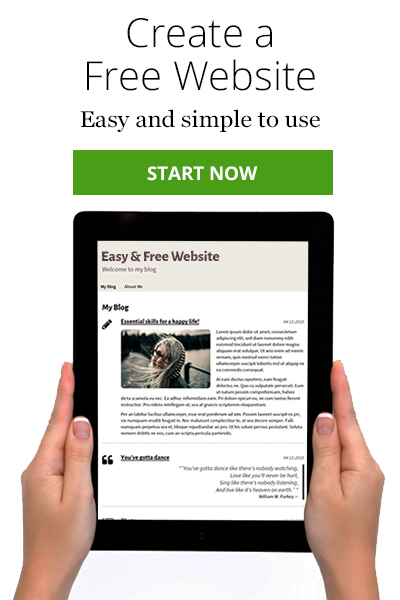 With SimpleSite you can build your own FREE website in minutes. It is extremely easy and stays free forever! Click here to build your own FREE website with SimpleSite. Don’t use words that can be found in the dictionary. This means any word, from “aardvark” to “zymogen” and everything in between. Software specifically designed to plug in words from the dictionary exists, and some are even able to combine multiple words from the dictionary at a very high speed. This means that passwords like “GreenApple” or “SunnyDay” are also too easy to crack. We’ve all heard that a password should have at least 8 characters. The more characters, the better. But do you also know why? Say you have a password with 5 letters, like “maria”. A five-letter password has 10 billion possible combinations, and can be cracked in 5 seconds. A six-letter password would take 500 seconds to crack, seven letters would take 13 hours, and eight letters would take 57 days. So you see: for each additional character you add to your password, the amount of time it would take to guess increases immensely! Let’s admit: many of us do this, because it’s simply the easiest thing to do. But using the same password for multiple websites and accounts can lead to identity theft if just one of these accounts gets hacked. You wouldn’t use a single key to open your front door, your car and the door to your office. So try to use different password for your accounts. If you still want to do so, at the very least use individual passwords for your most important logins, like your bank account, your e-mail accounts, and your social media accounts. Your name, age, date of birth, the name of one of your parents or children or pets… All this information is neither private nor difficult to guess for either computers or hackers, as much of this information is readily accessible on social media accounts and other websites. Steer clear from this “easy to remember but also very easy to guess” strategy. So how should you come up with passwords that are harder to crack, but still easy enough for you to remember? Try to follow the keys that make the password 3EDCft6 on your keyboard – it makes a V shape (see image). The same for the password 2WDCft6YHNji0 – except this password will create a W shape on your keyboard. The only things you need to remember is whether you have a V or W shape, which key on the keyboard you should start with, and where you used lower or uppercase letters. Instead of using your pet’s name and the date of your birth as password, you can use an abbreviated phrase instead, such as “I got my dog Rover on the first day of October 2006”. This becomes the password IgmdRot1stdoO2006. You simply have to remember the first letter of each word in the sentence. Another tip is to take a sentence, such as ILoveBurgers, and for each account you have you add the relevant word in front of burgers. For example: ILoveBankBurgers, ILoveFacebookBurgers, ILoveYahooBurgers, and so on. Don’t have a website yet? With SimpleSite you can build your own FREE website in minutes. It is extremely easy and stays free forever! Click here to build your own FREE website with SimpleSite. Forgot your SimpleSite password? Go to www.simplesite.com, and click on “Login” in the upper-right corner of the screen. Click on Forgot password and fill in username you’ve used for your SimpleSite. Please note: If you are already logged into your website, it will SiteEditor instead of Login in the upper-right corner. The new password will be send to the e-mail address you used to create your SimpleSite with. Remember to check your spam/junk filters when you’ve requested a new password from SimpleSite, as it may end up there. Don’t reset your password multiple times – this means you will have to figure out which password is the latest one that has been recreated for you. Request a new password once and check your e-mail inbox. If you have more than one website with SimpleSite, be aware that the username you fill in actually belongs to the website in question you are requesting the new password for. Passwords drive me nuts. At the last count I have about 200 passwords. Some short and the same for sites that demand a PW but need no security, some longer. Then I am told I need a capital letter, then a number, then a character (! or? or § etc.). Then I might have to swap that for a number box where the numbers change place and so on and so on. So it's no wonder that I have to write them all down, which sort of defeats the whole operation. OK I do not write the real PW but an easy code that can be looked up on another piece of paper, which has the PWs in a short form. WHY NOT A FINGER SCAN / EYE SCAN or A BELLY BUTTON SCAN (?) instead. Passwords drive me nuts. That is a very helpful tips to create a hard password. Now I have great idea to share I've learnt. That's fun how all these programmers try to compete each other. And one wish to hide and protect data and another ones wish to steal that data and hide themselves. I really appreciated to found my self in orders that have online blogs, I hope that my blog will very interested to you. Thank you.